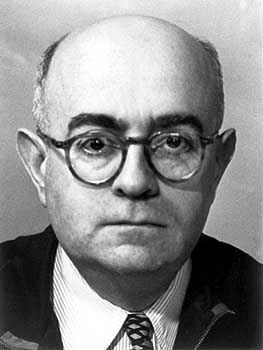 Theodor W. Adorno was a German-born international sociologist, philosopher, and musicologist. He was a member of the Frankfurt School of social theory along with Max Horkheimer, Walter Benjamin, Herbert Marcuse, J�rgen Habermas, and others. He was also the Music Director of the Radio Project from 1937 to 1941, in the U.S. Although less well known among anglophone philosophers than his contemporary Hans-Georg Gadamer, Adorno had even greater influence on scholars and intellectuals in postwar Germany. In the 1960s he was the most prominent challenger to both Sir Karl Popper's philosophy of science and Martin Heidegger's philosophy of existence. J�rgen Habermas, Germany's foremost social philosopher after 1970, was Adorno's student and assistant. The scope of Adorno's influence stems from the interdisciplinary character of his research and of the Frankfurt School to which he belonged. It also stems from the thoroughness with which he examined Western philosophical traditions, especially from Kant onward, and the radicalness to his critique of contemporary Western society. He was a seminal social philosopher and a leading member of the first generation of Critical Theory. A successful work of art is not one which resolves contradictions in a spurious harmony, but one which expresses the idea of harmony negatively by embodying the contradictions, pure and uncompromised, in its innermost structure.